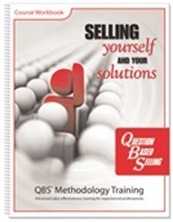 Question Based Selling (QBS) is a proven and highly leveraged sales methodology that teaches salespeople and sales teams how to differentiate their products, their company, and themselves in an increasingly competitive marketplace. 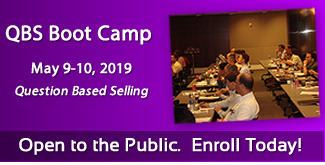 The One-Day QBS Sales Training “Blitz” is a condensed version of the full methodology training—which is often perfect for regional sales meetings or sponsored partner events. In a single day, we can deliver enough of the QBS system to empower salespeople and their support teams to re-engineer their effectiveness to open more doors, deliver greater value, and ultimately, close more sales. Question Based Selling (QBS) is a new approach to increasing sales effectiveness, based on the theory that what a salesperson asks and how you ask, is more important than what you could ever say. Just because a salesperson wants to ask a bunch of questions, doesn’t mean prospects and customers will want to openly share information with someone they don’t yet know or trust. If you look around your current company, you will find that some salespeople are more effective than others, selling the same types of products to similar customers. Rather than just defining the sales process, the key to boosting performance is to increase individual effectiveness to the next level. A One-Day QBS “Blitz” will show you how to be more effective and also how to duplicate success. Making lead generation a self-fulfilling prophecy. Increasing your "hit rate" when calling new prospects. Leveraging strategic questions to identify more needs. Navigate to decision makers and key influencers. Establish more credibility earlier in the sale. Motivate different types of buyers. Expand the scope of existing opportunities. Escalate the prospect’s sense of urgency. Prevent objections in addition to handling them. Qualify and accurately forecast sales opportunities. Besides just teaching the methodology, Question Based Selling programs focus on implementation by giving participants an opportunity to experience the techniques and skills they learn using a series of exercises and interactive workshops. This hands-on approach reinforces QBS concepts to make an immediate positive impression on the salesperson and the organization overall. Question Based Selling was designed for the entire sales team. In addition to teaching salespeople how to differentiate themselves and their products, QBS will also enhance the ability of sales support professionals, engineers, marketing, and sales management to convey greater value. 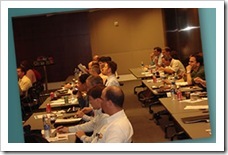 A QBS methodology course is also a valuable tool for developing strong distribution channels. Your VAR and channel are being deluged by product information—but they’re really thirsty for are strategies and techniques that enable them to differentiate your offerings. Companies that don’t take the time to show partners how to penetrate new accounts, how to create a greater sense of urgency, and how to convey more value, leave the door wide open for your competitors secure the loyalty that comes from such mentoring opportunities. Many QBS clients invite their partners to attend their company’s QBS training, which is an effective way to ramp up your extended sales force. No formal prerequisites are required. 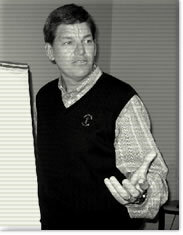 Many people who attend QBS training have read one of Tom Freese’s books or own the CDs. This is not a required prerequisite, however. In fact, since most people only read a book once, we recommend (when asked) that at least one of the books be distributed as part of the training experience so that it becomes a tangible resource for the participant when implementing the methodology. 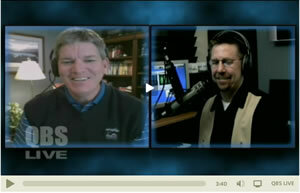 All Question Based Selling programs are customized for the intended audience. QBS methodology programs are delivered in a highly interactive, lecture-based format. The relevance and specificity of the material is a function of the quality of material provided by the client in advance, the length of the time allotted to the training, and the specific business objectives and priorities of the client. Unless otherwise specified, all of the items listed must be provided and be in good working order, for the QBS event to commence. QBS speakers will bring their own laptop computer and provide all appropriate training handouts.